alaTest ha raccolto ed analizzato 26 recensioni su Babyliss 7180U. La media della valutazione per questo prodotto è 4.0/5, confrontata con la media della valutazione di 4.3/5 per altri prodotti. Abbiamo analizzato differenti valutazioni di esperti ed utenti, età del prodotto ed altri elementi. A confronto con altri prodotti, Babyliss 7180U ha ottenuto un alaScore™ complessivo di 85/100 = qualità Molto buono. I purchased this as a gift. Was well received, would recommend. this will be my second unit and I am very pleased with it. Just had to get this current one replaced as it stopped working after a month. obviously a minor issue as the last one lasted for years. I have replaced it with the same again. It's sort of ok,not great. 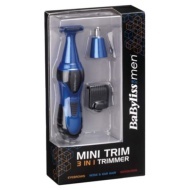 Changed to buy a different one- BaByliss 8 in 1 grooming kit which costs only £5 more but comes with LOT more attachments especially if you are looking for a trimmer for styling your beard. After reading some bad reviews about this product I was a little reluctant to purchase. But after using it I have had no faults with it at all. Got as a gift and the multifunctions went down a treat! The Simple Way To Shop !